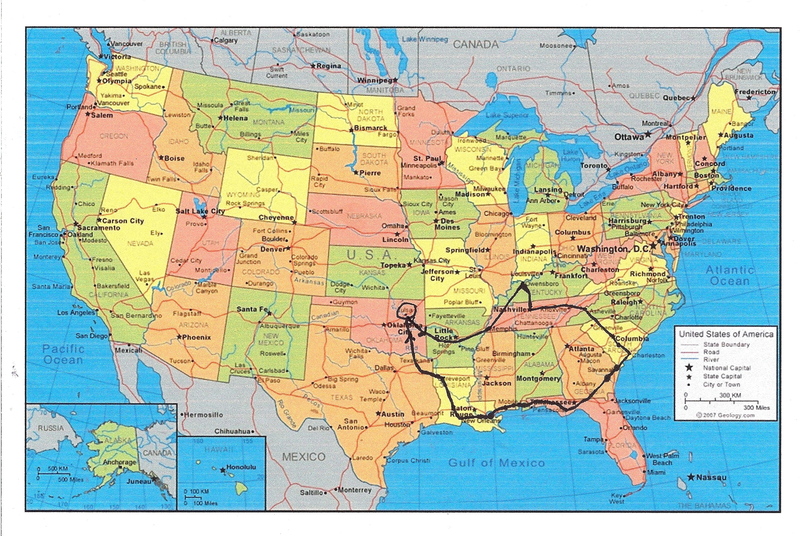 I’m just back from a fourteen day, 3,500 mile, 12 state driving trip…a loop from Oklahoma to Charleston and Savannah and back. More to come on all of that, but I’m mostly glad to be home. Mostly, I said. The reality is that it takes awhile to get out of that routine, harder than the planning to leave, more tedious than the trip itself. About an hour or so away, we got pulled over by the highway patrol. He looked at the packed car and we visited about where we’d been and that we were heading home and he said we went over the speed limit a bit while passing a semi on the interstate. It was the beginning of Labor Day weekend, so caution is the rule. He gave us a very gracious warning and sent us on our way. Sigh…that was even a pleasant experience. Opening the door, the dogs are jumping, the cats are meowing…their people are back. I’m not one who can just leave stuff in the car, so we unpack all we took and all we brought back with us. Then I start sorting through the piles in the house, throwing dirty clothes into the washer, putting flashlights, first aid kits, food away. It’s overwhelming. It seems like there is a house full of stuff coming out of the car. All my purchases…another blog…are stacked around. There’s a bag of receipts, books, maps sitting here still. The pets need to be fed. The plants need to be watered. The mail needs to be opened. Emails need to be deleted. The over 900 photos I took need to be downloaded to the computer for sorting, cropping, fixing, deleting, deleting, deleting… A serious trip to the store is ahead. Everything I left undone before the trip is still here, staring me in the face. The next day was nothing but sorting, errands, and total fatigue. And college football started…I could barely raise my arms when OSU scored! It will take days for the dregs of the trip to be absorbed into my house, for me to sort through my thoughts and memories, aided by the photos. And, real life starts up again immediately, as always. Do I still love road trips? You bet! Am I glad to be home? Always. Time to make that trip part of my life experience and take what I’ve seen and learned and use it to more clearly understand the world around me. Ahhhhh…home is so sweet! first time to your site and i love it. i am looking forward to your posts as we are planning to do a little similar trip from LA to NYC in december. Thank you so much! I love road trips. I hadn’t been to the southeast by car in years, so it was a treat. Can’t wait to hear about your trip. I’ll be posting much more! yes pls post and i have followed your site so i can read when its done!